CHICAGO (WLS) -- With the 2016 presidential candidates spending so much time on the road and having to order out food, one website wanted to determine just how much money was spent on pizza. 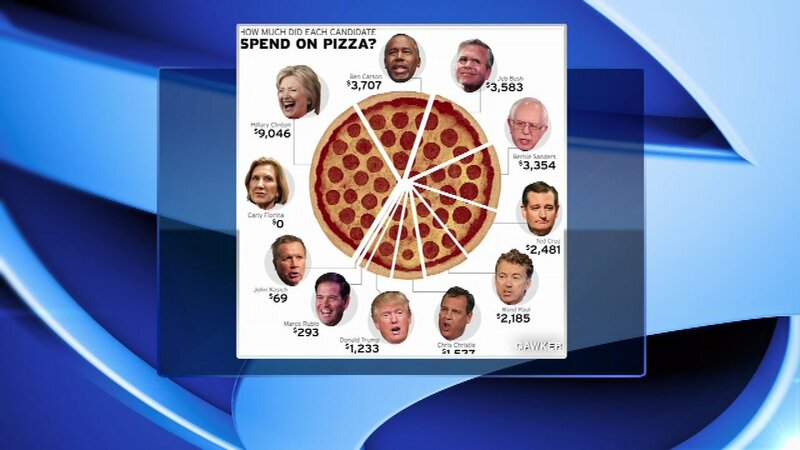 Gawker cooked up a graphic showing exactly how much each campaign spent on pizza through December. The clear winner was Hillary Clinton's campaign which spent just over $9,000. Ben Carson came in second with just over $3,700, then Jeb bush with just over $35,000 and finally Bernie Sanders with just over $3,300. Carly Fiorina's campaign came in last, having spent no money on pizza at all.